I’m working on a project today and so far it’s kicking my tush. lol I will persevere, though, I will! Hope to share it with you soon! 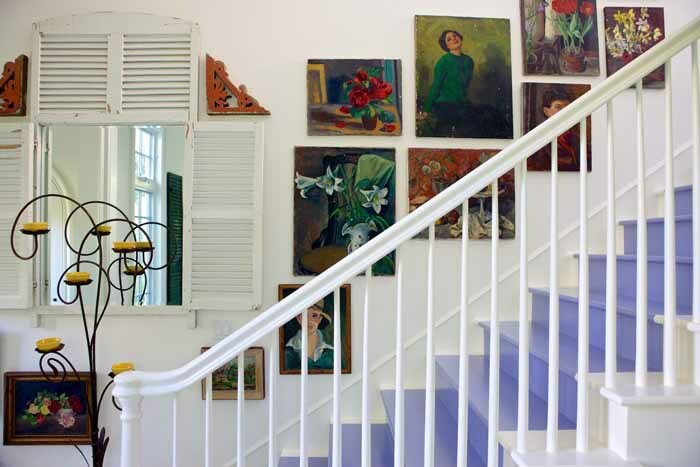 In the meantime, how about a tour of the happiest home in the world. I’m dubbing it that and I think you’ll agree once we step inside. This Santa Monica home is truly a breath of fresh air, especially on this gloomy February day. 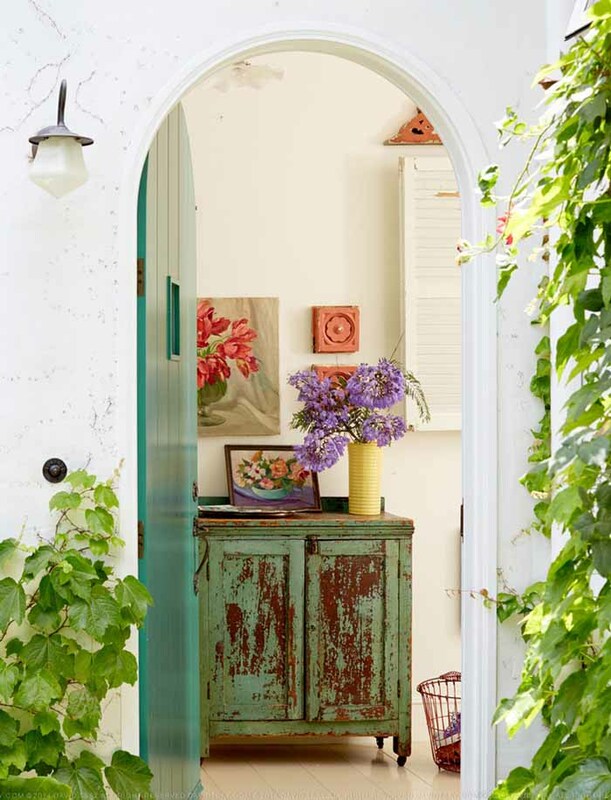 The home, built in 1927, belongs to designer Alison Kandler and it steals your heart right from the start with its ivy-surrounded, arched front door. The colorful hooked rug here in the living room is from Dash & Albert. They always have such great rugs! This home was featured in HGTV Magazine and in the picture below you can see they rearranged the furniture a bit for the shoot. 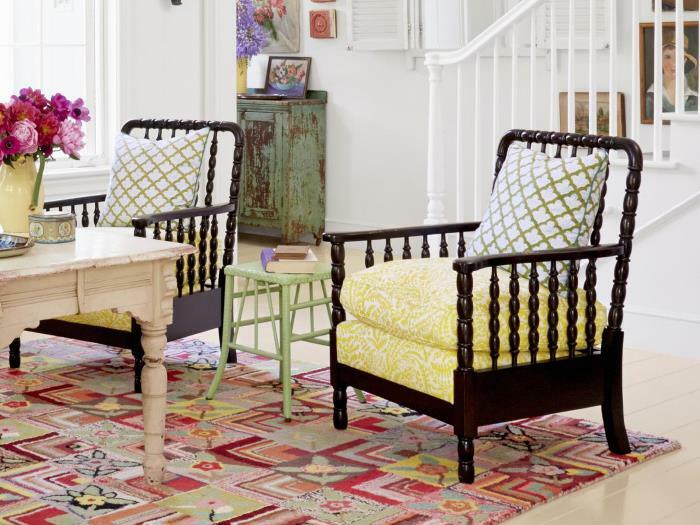 These wonderful chairs are called Bobbin chairs…love that! The beautiful Raoul Textiles cushions and Roberta Roller Rabbit pillows add to the fanciful feel of the chairs. 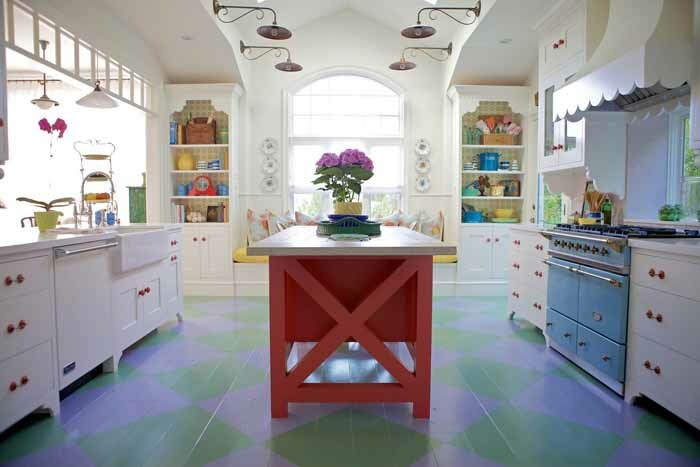 There are so many things to love about the kitchen, including its painted wood floors! The island was custom-built and is painted in a Benjamin Moore color called Claret. It matches the Anthropologie ceramic knobs and pulls in the kitchen. The top of the island is actually fir and it was built to look like an old door. Don’t you love the color of the range! It’s European and is made by Lacanche. Is that hood not the cutest and so perfect there! 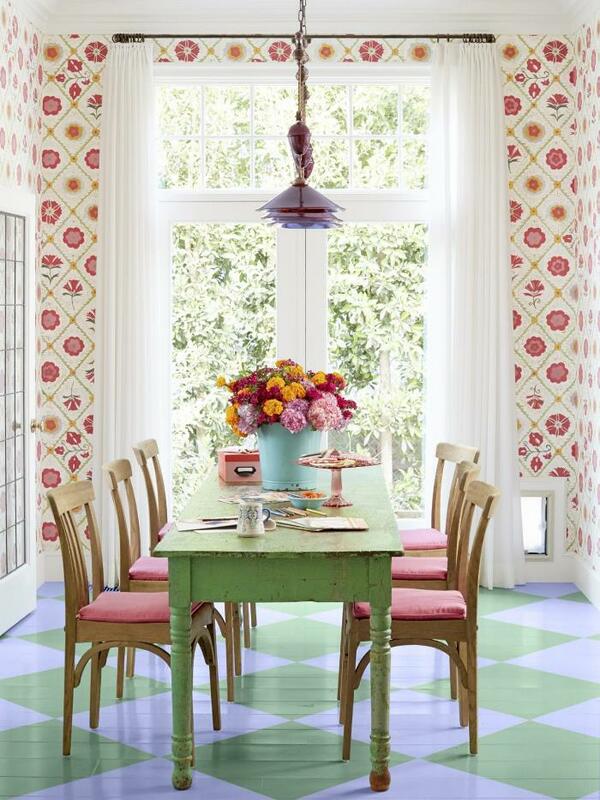 The older I get, the more I want to live like this, surrounded in wonderful, fanciful color! Notice how the upper trim around the cabinet matches the hood. Love! Is this not the happiest place to start your morning?! I love how Alison boldly mixes different fabrics and it all works like a beautiful garden growing inside. Love the wallpaper in the dining room! There’s a sneaky little doggie door hidden near the curtains, do you see it? This room serves dual purposes acting as Alison’s home office, as well as a much-loved gathering spot for her family. What a happy home to live in and to grow up in! The whimsy continues right through to the laundry room. 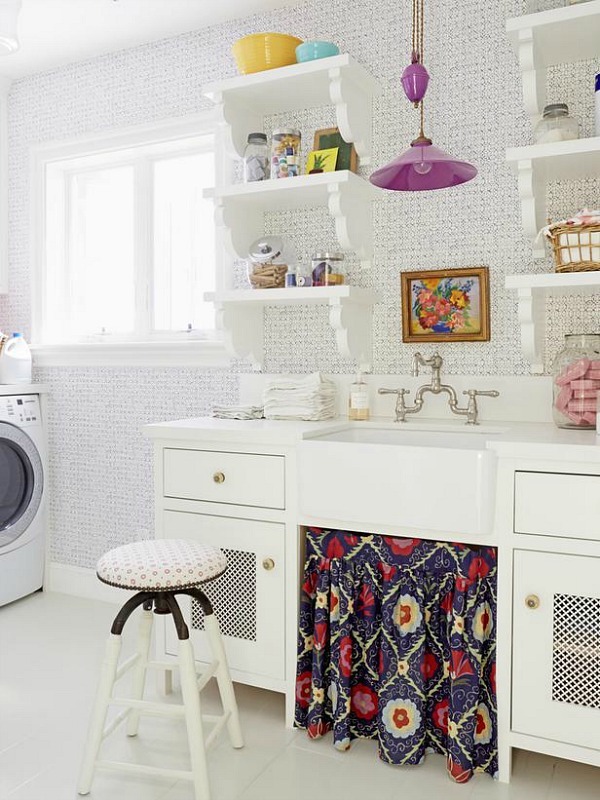 This proves even laundry rooms can be fun! I have a back staircase I will need to paint if/when I add hardwood flooring to my upstairs family room. The periwinkle color of these stairs is giving me ideas. Maybe I should go with a bold, fun color since my stairway is off the laundry room. This bedroom is an addition that was added in 2011. 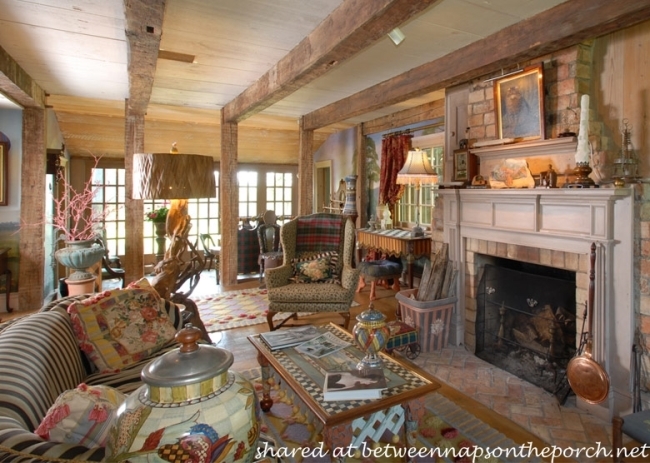 The reclaimed wood beams make it feel like it’s been here forever. The trunk is a fun flea market find. Remember when I shared a lamp I had made from cute ceramic doggie? Alison had bedside lamps made from these beautiful jars. I love the shade she chose for it! Another enchanting bedroom! I love bright pink/raspberry colors and it’s delightful paired with sunny yellow! I wonder if the yellow lamp is another one that Alison I had made…I bet it is. Beautiful bed! Love this bathroom! Notice the chandelier! The tub is from Cheviot Products and the color was custom done in the same shade as the island in the kitchen. This is the view from the breakfast room window seat. The creeping fig adds to the storybook feel of this home. 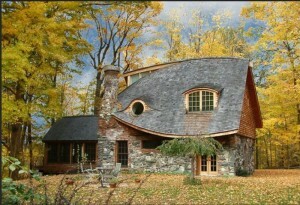 Such a happy, whimsical, storybook home! 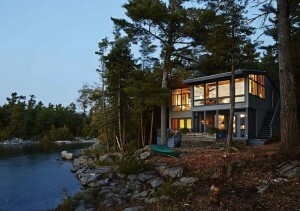 See more of the cottage featured today at Alison Kandler Interior Design and at HGTV. Photography is by David Tsay. Wow! Great way to start my day. Love the colors thru out this home, makes me want to redo my laundry!! Thank you for the cheery start to the day! The older I get the more I enjoy lots of color so I could totally live in this house. 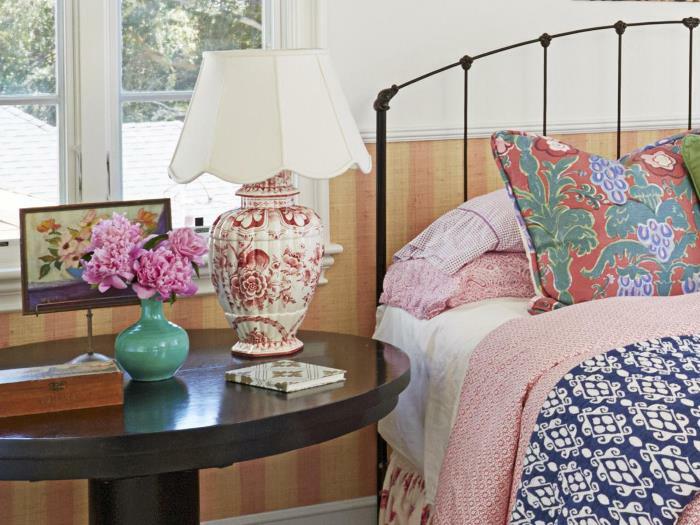 It is beautifully decorated and color-balanced–something I’m sure I could not do. But, I can always add more color! Love this! We really do need to use more beautiful colors; life is too short not to. I especially loved the bedding in each bedroom. How could anyone ever be in a bad mood in that home? Thanks, Susan! Oh, what a breath of fresh air! I love this home and all the colors. Thank you for such a lift on this cold, icy day in Texas! 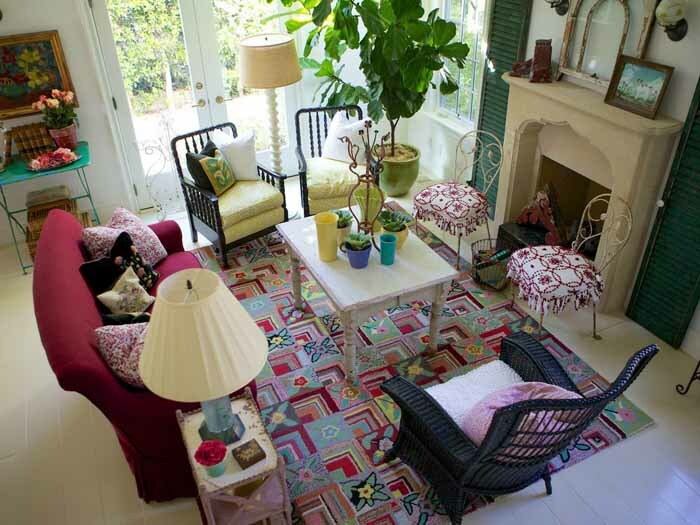 Love this bright, happy home! I wish I had the courage to decorate with whimsy. I love every itsy bitsy detail of this charming home…….Love the lamps made from jars, the kitchen and all the light filled rooms!!! Wow, I want this!!! So happy!!! Love this house, so colorful and happy! Love all of the yellow touches too. We have my Grandfather’s iron Bobbin twin beds from when he was a little boy, they are close to if not over 100 years old. My Sister’s boys are sleeping on them now, so they are still in use! What a refreshing change. In a decorating world where we are told to have neutral furnishings and jazz it up with accessories, this proves that colour can work. What a bright, cheery house! I even love the Jacaranda trees in the front. They make a mess when they drop their flowers, but are so beautiful when in full bloom. Oh what a pretty home! I love the walkway leading up to the house. It’s right out of a story book. 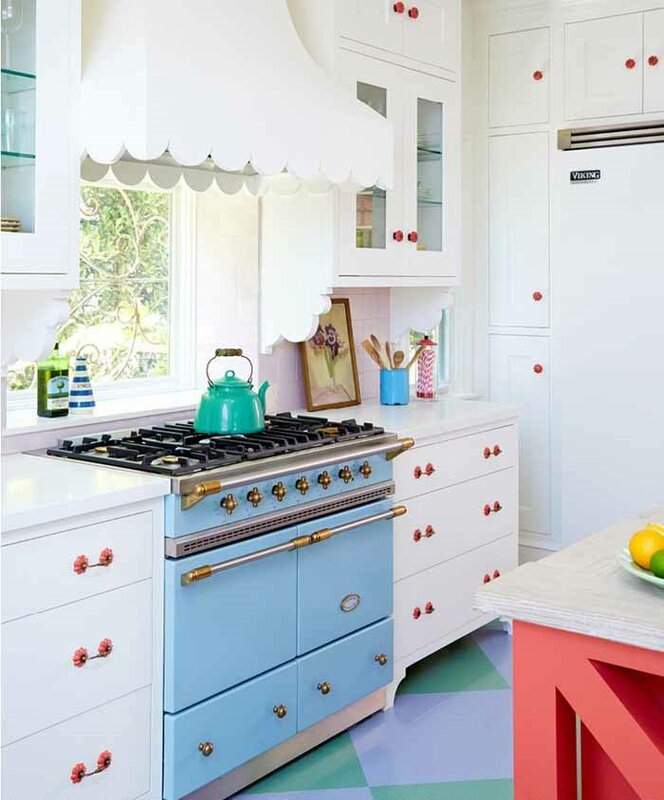 Love the blue stove and all the bright cheery colors! This is a wonderful home, I totally agree with you. I feel color is magical also, TFS. What a cute, refreshing, and cheery home. I love see the homes you post on this site. Your site is beautiful and enjoyable!! .Love it! This is one happy home! I love color and this makes me smile. Oh I know this house tour!!! 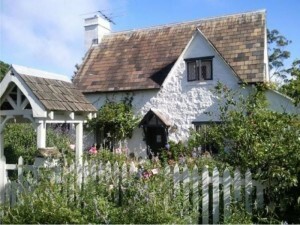 It is one of my fave cottages ever. I think I’ve pinned every rooms several times over. I love the house. I don’t like ivy because of critters being able to climb on the house and possibly get in. And after watching Rehab Addict, I couldn’t do the floors with the paint no matter how cute it is. Does anyone remember the show on HGTV where couples went into a neighbors house and redid a room? Well, one couple got extremely upset when hey painted the floors in the same pattern. I would be happy with just real wood floors. Now that is my kind of house! It’s so happy, homey, bright and cozy. I love houses with personality that suit the homeowner. Really lovely, but I’m still loving white! Oh my goodness, I could move right in there. It feels so good to me to see the colors in that house vs. all the white that is popular now. Funny thing is, I love the white too but the colors just feel good. I love all the color in this home. I enjoy all the whites, blues and greys in other people’s homes, but I have to have color! This was an enjoyable home tour on a very cold day. Thank you for another great one! What a happy house and home! 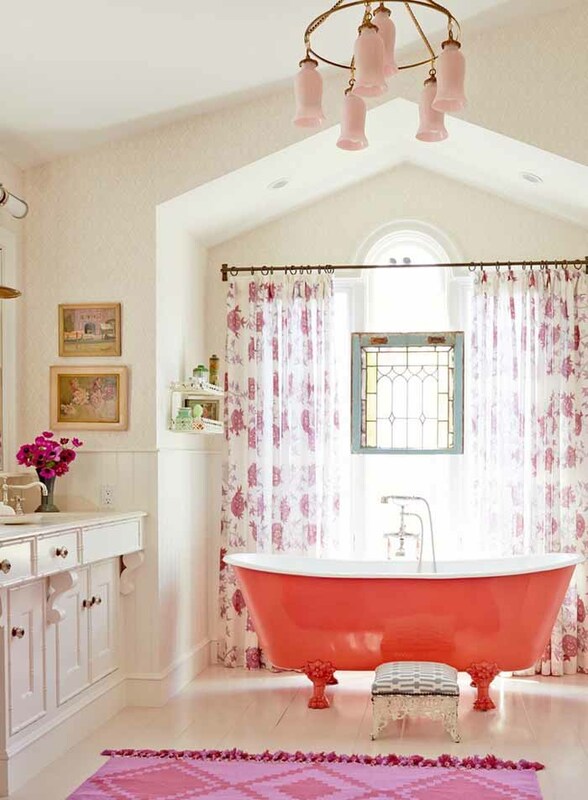 I love all the colors but I think my favorite is the white, coral and raspberry bath. A touch of yellow…maybe some sugar cookie, here and there, and I would be very happy with my entire home in those colors. My sweet husband picked a linen, brown mustard colored sofa with brown and rust pillows and chair. I sold them before we moved. Given the chance, I will pick happier colors next time. Delight! I really like the interiors of the house, especially in the living room area. The color of the decorations synchronizes to the interiors. This is definitely cute and whimsical! You could not complain about being bored here! 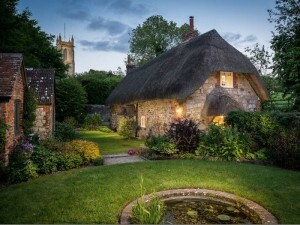 Love this cottage. 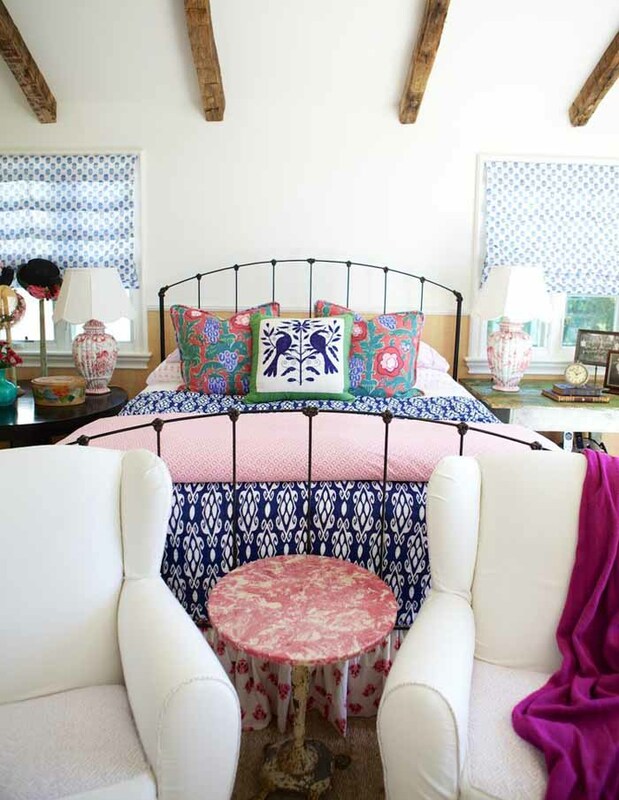 I always like to see the bedrooms, and these are very pretty and cozy. Side remark: I wasn’t seeing any emails from BNOTP…so went on your website, and signed up again. Good thing I did! Can’t go too long without having a BNOTP! !